Could game-based learning have a monopoly on education? All kids love games, whether they are physical or mental games. As a child one of my favourite games to play was Kerplunk and the sheer fun of watching the marbles fall even today reminds me of the good times we had meeting up with my cousins each Christmas. Nowadays it is all Minecraft or Xbox in my family, games that one plays on their own mostly. We did have a Wii which was popular with us all and fun and we played this together as a family, but times have changed as have my kids. They like the challenges that today’s video games bring and the idea of improving by practice. How different is this to learning a new skill or gaining knowledge in school? Yet the two are perceived very differently by both educators and students. What place do games have in the classroom? Engaging students is important so that they love to learn and games can play a part in this process. At UWCSEA we integrate the idea of games or gaming but how successful is this? As I was searching for a video clip of Kerplunk in action to educate the younger viewers reading this post, I stumbled on an unusual article by a Psychologist using the game to stimulate discussion on natural selection! Certainly not something I would have associated with the game but an intriguing concept. This in turn reminded me of an ice-breaking task Grade 6 engaged in Life skills using Jenga with questions taped to them to trigger discussion and helping them to get to know one another better. So too was Jenga used in an awareness campaign against Shark Fin Soup yet in a huge format set up in an outdoor space over lunchtime. The idea was to illustrate what happens if you take out one species in the food chain and specifically raising awareness of sharks. In the classroom, I have used buzzers in team games to review content with Grade 6 (specifically on the Elements and Principles of Art and the corresponding vocabulary.) They couldn’t get enough of it! So it appears students love the idea of games integrated into the curriculum. But we must make sure that they are there for valid reasons (not just for fun!). Science teacher, Tony Deeley uses Triptico resources with a variety of classes to check understanding and review work and watching his classes engagement and competitiveness was clear that they have a rightful place. Just last week a podcast on the BBC website (http://www.bbc.co.uk/programmes/b04g8qfg) talked about the cognitive behaviour associated with gaming. 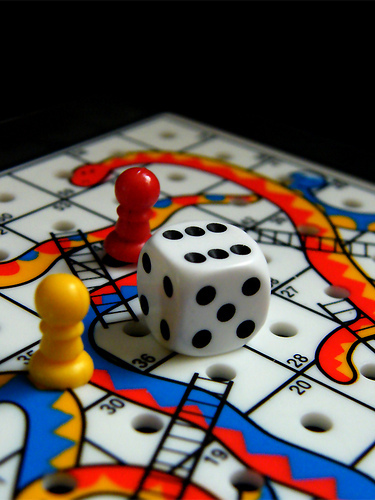 Dr Paul Howard-Jones explains how the idea of uncertain reward in most games, ranging from snakes and ladders to Monopoly made the game more engaging, exciting and inspired motivation. Could this concept help students to work harder in a competitive way with their peers? The podcast focuses on a school in the UK using Zondle, a quiz/game show style online software company, within a Business Studies class of Grade 10 students where we hear students battling away in groups and deciding to “gamble” their answer for more reward. One student explains how the competitive nature of these quizzes pushes him to revise more to beat his peers and another says the intense music and the suspense drives him. That reminds me of many nights gripped by Who wants to be a Millionaire. But is the learning better using this approach? How do you see this transfering to your classroom? How might the concept of uncertain reward help your students to achieve higher and give them incentive to learn? I stumbled on Gamifi-ed wiki which has lots of game-based learning activities to try out from cockroaches vs Algebra to the 4 litre challenge. I am sure there are lots of other examples of teachers using this approach to motivate learning but is this what students want? Is it gimmicky or just a fad and is there real learning happening? Do we ask our students how we can tailor the content of our lessons to their learning or do we listen to their ideas on how they are motivated, inspired and want to learn? and how does this idea of game based learning transfer to High School? Last month at Learning 2 I attended the workshop run by Jesse Scott on Gamifying Assessment and it is interesting to track his progression from his COETAIL post, Everything’s a Game in April 2012 to his practice in the classroom now. The concept lies in intensive planning of the curriculum content where students work at their own pace through the challenges and tasks to reach the next level. Jesse says that he stops the class frequently to input new learning yet students are happily working through the content. It intrigues me and I have a feeling I will be addressing this concept myself during Course 5! The idea of a Leaderboard worries me though, as I wonder if this would be motivating for the best students, always at the top yet demotivating for the lesser able, always struggling 2 or 3 steps behind, particularly in my subject of Art. I like the idea of students having progressive levels, perhaps colours that help them progress, a little like the Elementary reading book stages my son had in the early years. I also appreciate the concept of students self selecting and being able to move at their own pace, a bit like an iTunes U course. At UWCSEA our focus this year is on Differentiation and it seems to me that this could be a powerful way to motivate, inspire and engage, yet help all to achieve if planned right. Could my Middle School students develop Art Superpowers as the year progresses? Powers and skills such as: observation, thinking, idea developing, analysing and discussing. 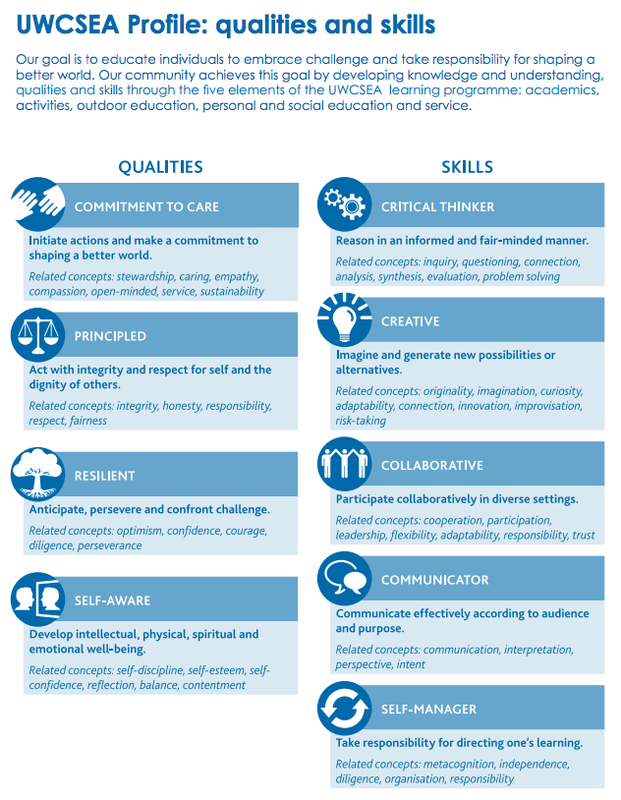 Or holistic skills that reflect our school mission like collaboration, resilience or communication. How might a gamified curriculum help students to achieve these skills and gain points for your profile? Would it have to be just in Art, why not for across Middle School? This would not be a small idea, but when have I ever done things by halves? As a Head of Grade I would love to push this forward with my grade group of bouncy gaming boys and highly motivated individuals. What if the year in Art was a board game or a platform based game or a quest with a series of challenges? 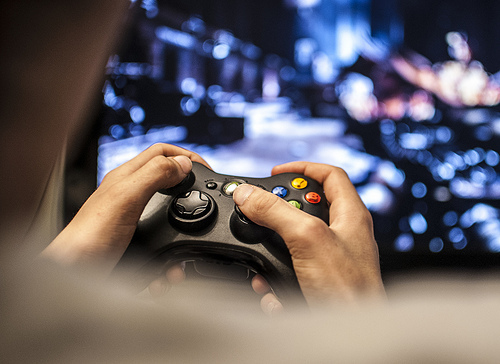 Teenagers love challenge and video games for years have had kids hooked yet, according to Dr Paul Howard-Jones, it is the combination of cognitive function plus fun that makes their integration in education so intriguing. Games that are based on choices and reward are the ones that motivate us the most. Think Tetris, Donkey Kong, Sonic, Super Mario, Pacman, Candy Crush or GTA. Knewton and Column Five Media document Gamification through their Infographic on the right. It is clear that there is a difference between game-based learning and gamification. Gamification is the use of game-like mechanics and systems to non-game situations such as Leaderboards whereas game-based learning is simply using games. Serious games is a the concept of using real world examples with the concept of game or simulation to solve problems. 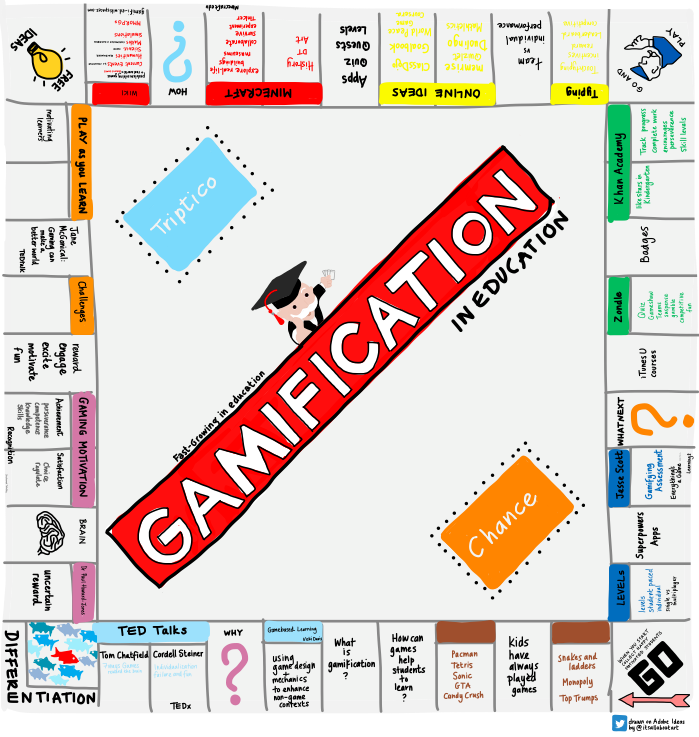 Teachthought documents the process of adding gamification to your classroom on the post back in 2013. Watching Tom Chatfield’s TED Talk 7 ways Games reward the Brain, I am reminded of a conversation with my hairdresser the other week as I read the latest gossip magazine to escape the mountain of emails I could be addressing whilst awaiting my hair to be finished. We laugh at the images of Kim Kardashian in Heat magazine and I ask, “What exactly does she do?” Lydia grabs her phone and shows me her latest app, Kim Kardashian Hollywood, a Barbie World meets Sims concept, where you create your own celebrity character, dress it, go to photoshoots and see if Kim rewards you and accepts you to help you rise to fame and fortune. In her early 20’s, Lydia is horrified at how addictive it is and how she is currently lining Kim’s pocket as she dresses to seek approval. I laugh yet see the addictive and costly implications to our impressionable teenagers and how “clever” Kim Kardashian has appeared to be to get (even) richer. Currently it is estimately made the star $43 million in 3 months reported on MSN news! Surely we could develop a far more ethical app for our already beauty and fame obsessed youngsters, especially girls battling with self esteem issues. Surely with this powerful concept, we can encourage positive behaviours such as caring, manners, or reading for points or rewards. Maybe then I can give up the day job? Never! As always, great ideas Nicki. I can’t wait to how this seed of game-based learning/gamification might bear fruit in Course 5! 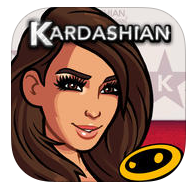 I’m also intrigued by your anti-Kardashian app… While it doesn’t have the star power behind it, I think that idea of a game/app that helps to reinforce positive body image and behaviors is a great one! I have so many (too many) ideas for Course 5 it is insane. I need to clarify my thinking and how best to apply my learning to fit my students context. But this concept really resonates with me. As for the App, I’ll work on it! Did you like the visual? Currently working on visual ideas for reverse/flipping! Sorry for the delay! Have a good week. Did I like the visual? That goes without saying at this point in time! Our superstar art teacher at YIS Aaron Reed took on a bit of gamification (amongst other things) for his Course 5 project (http://www.coetail.com/aaronreed/?p=271). Maybe it will be helpful in helping you sort out some of your ideas for you classroom/project? 3) And just how do you find the time??? 3) I have no life! Seriously – this is insanity – so much information here Nicki – I can’t even begin to tell you how many tabs I opened on account of your post – I think this might be my new gold standard. You have officially won the “Viewer Opened 7 Tabs” Badge. I too am interested in how my students might get Art super powers. I am thinking of looking at my units and distilling down some funny, serious, and random badges to award. Not sure how to make them – but may go analog to start. Is there a site or something you have come across to develop badges? I dig the analogy of the year like a game board and can see your points about the leaderboard. Perhaps against the ethos of your school? Could students embody characterizations of art historically accurate artists as avatars? Oh I like that…Give them statistical powers which may allude to their skills and have students choose and use them in a gamified unit….hahahahah….I just laughed at my own idea….sorry…I also just made a Basquiat avatar and love it….. I am glad you have entered the world of 20+ tabs open! Thats is what my screen looks like at the start of a new post planning for me! I think we should work together on the Art superpowers. 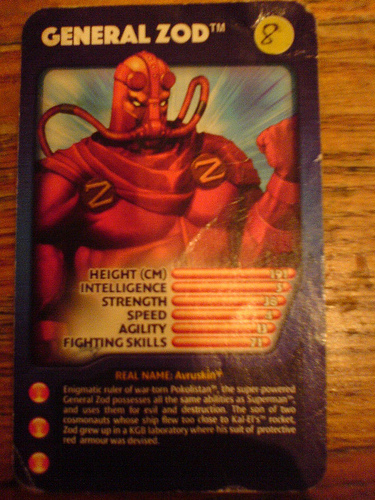 I was going to get them to make their own Top Trumps card to keep in their sketchbook (maybe digitally first). I haven’t used actual badges before but I am sure there will be someone in Twitterworld or COETAIL who knows – Clint? Can’t wait to see your avatar (love Basquiat). How is the work/life balance going? I do so enjoy reading your posts, thoughts and visuals. It’s a meal really. Perhaps we should all thank you for….well, not having a life, if you keep producing this. Thank you, also, for stretching my thinking. I’m still a reluctant gamificationer (definitely a gamivacationer, though) and I think I’m stuck on the badges and rewards and the addictions that keep popping up in posts. Do we really want addicted students? Engaged? Yes. Motivated? Fer sure. Following individualized paths and levels? Definitely. But obsessed and addicted? How do I surmount this? Should I? Through your post I’m realizing that gamification should go hand-in-hand with mindfulness to create balance in kids’ lives. Yes, please work on the body image app. Thanks again, Nicki, for pushing my thinking. You are so kind and I really appreciate your sentiments! I am loving these last 2 course theme, although the development of the visuals took me ages and I am currently struggling to visualise MOOCs and connectivism in a unique way! I need a MOCA (Massive Online Community of Advisors) to help me each week to brainstorm the theme and push my design skills to come up with the Big Picture! Did I just create a new hashtag?! Want to help me develop the app? I have the ideas, not the tech know how though! I enjoyed your reference to Kerplunk and the memory of how exciting it was to play. It made me stop and wonder what it was that made it so fun. Was it the “uncertain reward” aspect of being somewhat in control (but never totally) of how many marbles might fall? Could we somehow devise activities that are just as simple and exciting as Kerplunk to engage students in learning? In my class, I’ve used Jenga to help students understand the concept of a system, much like your description of how it was used to depict the parts of a food chain, but it isn’t particularly exciting, or addicting. That addicting part might be what makes students, like Cordell Steiner, clamor for more games in the classroom. In the video I’ve seen of students learning math facts in Ananth Pai’s classroom, a boy maneuvers a rocket past random numbers to get to the correct answer. Although he could have drawn lines on paper to connect the problem to the answer, dodging the incorrect answers probably gives students an adrenaline rush that makes them want to keep playing. Was this boy learning more than he would from a pile of flashcards? Probably not, but I doubt today’s students would willingly spend the same amount of time and effort learning math facts with flashcards. We need to make sure games are being used for valid reasons, as you say, keeping in mind that what we found engaging as children would probably barely register on a child’s engage-o-meter today. Although the games used in Ananth Pai’s class looked to me like little more than worksheets with (electronic) bells and whistles, maybe that is the new standard. Thanks so much Anna for taking the time to read and comment. I agree there are so many ways to approach game based learning or gamification. I am just inexperienced but intrigued as to the ways that it can be the most effective and engaging for my students. I think as long as teachers are trying out new ways to do old tasks and testing out what works and what doesn’t at least it is a step in the right direction. Not everything will work with every student in every school, right?! When Jesse Scott talked at Learning 2 about gamifying assessment it really grabbed my interest and I really want to try it out for Course 5 along with a zillion other ideas! Have you had much experience of this approach to learning? I would love to hear from anyone who has, successful or not! Thanks again Anna. I wish could find the time you have to put into writing your blogs. I really like how visual and easy to follow your blogs are. I was lucky enough to have gone on a filed trip with some grade 10 and 11s in the middle of this course and had the opportunity to talk to older students abotu gaming. Right now my school is having a difficult challenge of keeping students off games in class and no one seems to have the perfect fix. Well these grade 10 students were playing a game on their iPhone similar to HeadBandz where the student had to place their phone on their forehead and the other students playing had to give clues of the word that was on the screen. The students really got into this game and actually had to be quieted down a few times. They had so much fun playing that they didn’t realize they were learning. As an EAL teacher I could easily download this game to my phone and use it in class. After the game I spoke to the students regarding what they are experiencing in class with other students playing games. What was exposed was that this issue is a major problem for students in grades 6-9, but by the time you reach the end of Grade 9 you stop playing games in or out of class as you just have so much work to do. This makes me think whether the material that the younger students are receiving in class might not be as stimulating and as you mention in your blog that there are so many games that can be used in education or creating learning into games for the students to play and revise the material being presented in class. Great ideas! I too wish I could find the time to write and draw these posts! Thanks for reading! I agree that maybe games, if approached in the right way, do have a valid part in education and I know there are some cracking ones out there being used in a similar way. My son when he was about 8 started playing Cat physics on my phone (do you remember that?) and there are some great similarly orientated games out there now that he still likes. Who would have though projectiles and other Physics concepts would entice such young learners?! I also vaguely remember another cool game about colour mixing – Sand slides?? Art and Physics and gaming – who would have thought? !